The Kyrgyz State Property Management Fund (SPMF) has put 49% of Air Kyrgyzstan up for sale in a bid to lure investors to the flagship carrier. The tender results are expected to be announced in early September. If no investor materializes, Air Kyrgyzstan’s further development will follow a plan currently under development by the airline management. The SPMF opened for bids in June. The packet of shares being auctioned is worth around $2.8 million. The auction is part of a government program to sell out state property to private bidders in 2015-17. The relevant resolution was adopted by the Kyrgyz parliament in June last year. Foreign legal entities and individuals are welcome to bid. 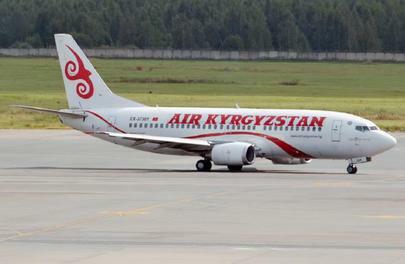 The winning bidder will be expected to buy at least five passenger aircraft for the airline, all aged 20 years or younger, and of the types meeting Air Kyrgyzstan’s development plans. These airliners are to be delivered to the carrier within five years. The winner will also be required to invest at least $1 million in the carrier’s working capital, and clear its outstanding accounts payable to the tune of $2.45 million, within 12 months of signing the agreement. According to the SPMF, the Air Kyrgyzstan fleet currently comprises four airliners: one carrier-owned 122-seat Boeing 737-500 (built in 1991, serial no 26419/2186, registration EX-37501) and three leased ships, namely a 148-seat Boeing 737-300 (built in 1992, 25162/2241, EX-37301), a148-seat 737-300 (EX-37013), and a 136-seat -300 EX-37014; both built in 1997 and jointly operated with Turkish carrier Rey Airlines; these two airframes’ serial numbers could not be ascertained. As of June 1, Air Kyrgyzstan employed 109 personnel. The airline carried 150,500 passengers last year. Its total assets were worth $12.3 million as of December 31, 2015. In early summer 2016, Air Kyrgyzstan reported its Q1 performance to the SPMF. The carrier’s revenue for the period amounted to $267,000. According to preliminary data, the airline’s accounts payable have been reduced by 41% through the sale of an aircraft (most likely a King Air 350 turboprop). In the meantime, Air Kyrgyzstan continued talks to acquire more airliners under financial lease contracts. The airline’s net profit for 2016 is expected to reach $120,000. Asked about the company’s future if no investor materialized, the SPMF source noted the Air Kyrgyzstan management were working on a variety of possible future scenarios. In January 2015, it was announced that Air Kyrgyzstan would be transferred into trust of Manas International Airport, the Kyrgyz nationwide airport management company. Nothing has been heard about this project since. Air Kyrgyzstan has seen its passenger traffic drop 2.2 times compared to 2013, and is fairing worse than Kyrgyzstan’s leading air carriers. The country’s largest airline, privately owned Avia Traffic Company, carried 466,000 passengers in 2015 (4.5% up year-on-year). In the meantime, Air Manas, a subsidiary of Turkey’s Pegasus low-fares carrier, continues to expand its 737-800 fleet.